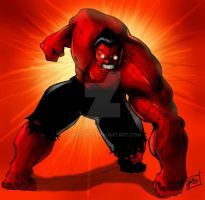 somehow this Red Hulk pictures out himself as even stronger and more intense than the Green Hulk...i wonder if he's still the original hulk who evolved into Red Hulk! well i hope he's not cause im luking 4ward to see 'em smashing each oder hehehe! Looks like a gray piece of metal went threw him instead of shorts on him. Ah this piece's contrasting is very intense. And thank you for your submission to In The Panels. If possible, please consider joining. tnx bro! really appreciate it! hehehe check marvel.com for info...actually his called now THE RULK! dude great job! this is amazing! tnx man! i really appreciate it! Man this is sooooooooo cool!!! tnx man! really appreciate it!